The Carrier comprises a pair of wheels, an extended shaft and a stand fro raising the mower to enable easy fitment and removal of the wheels. The 95mm wide rubber tyred wheels are ratched for easy steering. 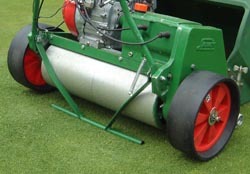 The square shaft locates in the rear roller to provide the drive, thus allowing the machine to be driven from place to place under its own power.